My mom had a dehydrator with pull out shelves and a clear front. I thought it was pretty cool, the fruit leather she made in it. 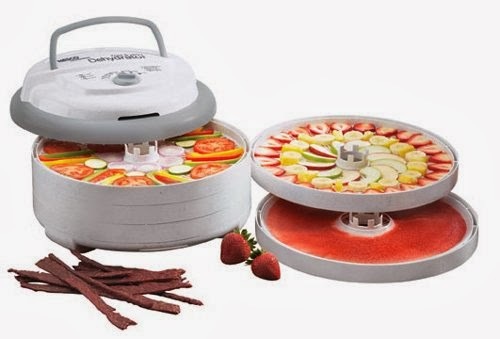 A few months ago I looked into getting a food dehydrator since my children like dried food and I wanted to make my own. I researched through forums and read different opinions and the food dehydrator pictured above was mentioned as a good choice for the home. It worked better than another more expensive brand. You can see more information about the dehydrator I have here and that is also where I purchased it. This dehydrator can be expanded. You can buy more layers. It is compact for the small space I have, and it is easy to use. I have made apple fruit leather, dried cranberries, pineapple, and dehydrated rice so far. I'm hoping to make some jerky soon, I just need to buy some meat first.